KU Leuven, Belgium bioscience engineers have developed a roadmap, so to speak, for industrial cellulose gasoline. The bioscience engineers already knew how to make gasoline in the laboratory from plant waste such as sawdust. In 2014, at KU Leuven’s Centre for Surface Chemistry and Catalysis, the researchers succeeded in converting sawdust into building blocks for gasoline. A chemical process made it possible to convert the cellulose – the main component of plant fibers – in the sawdust into hydrocarbon chains. These hydrocarbons can be used as an additive in gasoline. The resulting cellulose gasoline is a second generation biofuel. The team’s research paper has been published in Nature Energy. For this type of bio-refining, the researchers built a chemical reactor in their lab, with which they can produce cellulose gasoline on a small scale. “But the question remained how the industry can integrate this and could produce it in large quantities. Our researcher, Aron Deneyer, has now investigated this. He examined in which section of the existing petroleum refining process the cellulose is best added to the petroleum to obtain a strongly bio-sourced gasoline. 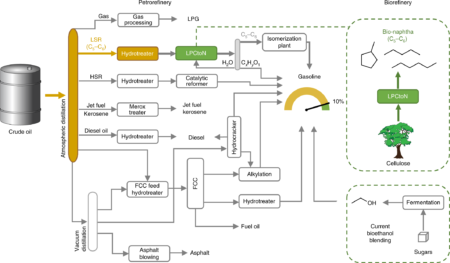 In other words, we now have a ready-to-use recipe for cellulose gasoline that the industry can apply directly: without loss of quality for the gasoline and making maximum use of existing installations, said Sels. Direct upstream integration graphic of biogasoline production into current light straight run naphtha petrorefinery processes. Image Credit: KU Leuven’s Centre for Surface Chemistry and Catalysis. Click image for the largest view. Click the link to the study paper for a complete explanation. This is very interesting research with useful results. And Professor Sels deserves some credit for optimism. But the petroleum industry has a quite good supply of crude oil, natural gas and liquids for now and are impressively always good at holding their market together. Just how they may find making money using this process is the trillion dollar question. Answer that in an exciting way and this will take off. Making plant waste into gasoline is an amazing breakthrough in resource and energy recycling. Hope there will be more and more similar discoveries so that we can find more solution to solve the energy issue worldwide.